Our wombats need your help. zxklsnvklsndkleklgjejgergmelrjgergklernlkrnhlkrtnhklrnthklrhklrhrntlhkrkasnclkalzx Please take just five minutes and contact Matthew Groom today. Tasmanian farmers are currently allowed to shoot wombats on their properties provided they have a permit to do so. This comes at a time when wombat populations in some areas are under significant threat from mange, to the point where local extinctions are occurring. So far, more than 50 permits have been issued allowing farmers to kill up to 50 animals on their properties. This is a unique and protected species with a slow breeding cycle and currently, we have no idea how many wombats there are in Tasmania … no one does. So the impact of removing 2500 wombats from the state has unknown, and potentially, disastrous consequences. We need you to contact Matthew Groom, Minister for the Environment, Parks and Heritage, and demand that he stop issuing these permits, especially at a time when wombats are under threat from mange. You can also post a comment on Minister Groom’s Facebook page. Take our poll and voice your opinion … the minister will receive the results. 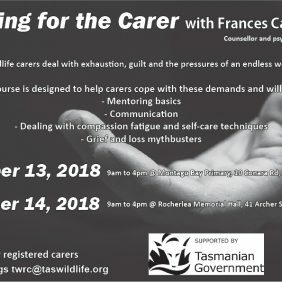 – Wombats are a protected species, and Tasmanian wombats are a unique subspecies found nowhere else in Australia. – There is no accurate assessment of wombat populations in Tasmania, so no one has any idea what the impact of removing large numbers of wombats from the population would have. – Wombats are under significant pressure in some areas due to mange, which has been identified in animals across the state. – Farmers should be required to provide evidence that they employed a range of non-lethal measures to manage wombats on their properties such as co-grazing, wombat gates and electric fencing, before even considering a lethal solution. 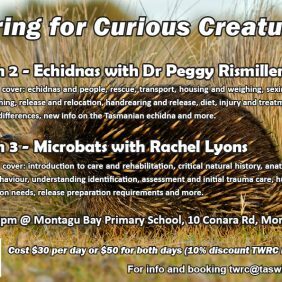 – It is vital that wombats are recognised as a natural asset, as valuable as introduced species like sheep, cattle and deer. – Culling does not work as wombats are territorial and when one is removed, another will take its place. Culling can also result in an increase in population numbers among target species. – Wombat co-grazing can actually improve pasture and they prefer to eat the hard silicon grasses/native perennial grasses, such as Poa grass leaves and roots, that livestock don’t eat/can’t tolerate so their grazing damage is very minimal. – Their dung provides microflora essential for making minerals available in Australian soils, and in droughts it acts as a seed reserve. – Research indicates 12 wombats eat about the same amount of grass as one sheep.